Stream geomorphology is the development and subse quent changes of a channel's physical dimensions over time. Stream channels are naturally altered by the dissi pation of energy from moving water. Regional underlying geologic features are affected differently by flowing water, so a large portion of a channel's inherent stability is dependent upon its local geologic history. For example, historically, low gradient, meandering streams such as the lower Mississippi River, USA, that flows through fine alluvial deposits, have a high natural sinuosity with rela tively low channel stability over geologic time. In contrast, approximately 2000 km away, is the steeper sloped Colorado River, which drops over 3000 m in ele vation from the headwaters to the delta. This river flows through uplifted erodible sedimentary deposits of sand stone, siltstone, and shale and has created a relatively stable, highly incised channel. Channels can be grouped into four general geomor phologically based classes: straight, meandering, braided, and anastomosing. Although helpful for differentiating general stream geometry, there is little correlation between stream class and sensitivity to anthropogenic disturbances. 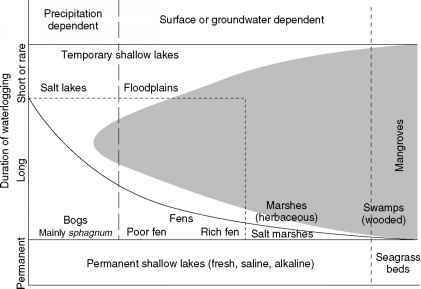 At a local scale, stream channels can be defined by characteristics such as length, width, depth, cross sectional area, slope, and particle size, all of which can be directly affected by channel, floodplain, and watershed development. A stream meanders to equalize the dissipation of energy of the flowing water, and produce an even slope as it flows through a basin. Channelization and the addi tion oflevees on many streams have occurred in the name of flood control. Channel straightening reduces the long itudinal distance, which increases the slope between two points (i.e., increases erosion potential), reduces the pool to riffle distance ratio, reduces the volume of water a section of stream can hold, and reduces stream habitat such as woody debris. Straightening of a channel increases the velocity through the channel, which can result in increased suspended sediment and bedload, and down stream flooding (Figure 1 ).